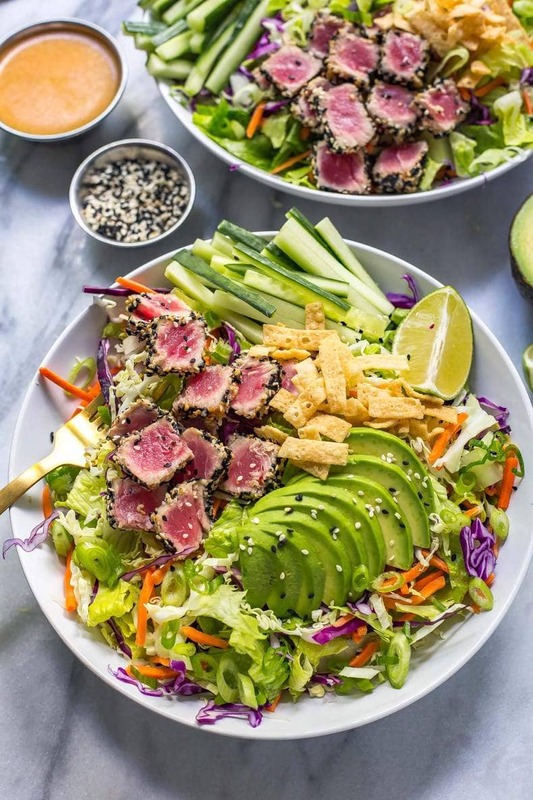 This Sashimi Tuna Salad with Carrot Ginger Dressing is a delicious, gluten free treat with a dressing straight out of your favourite sushi restaurant! 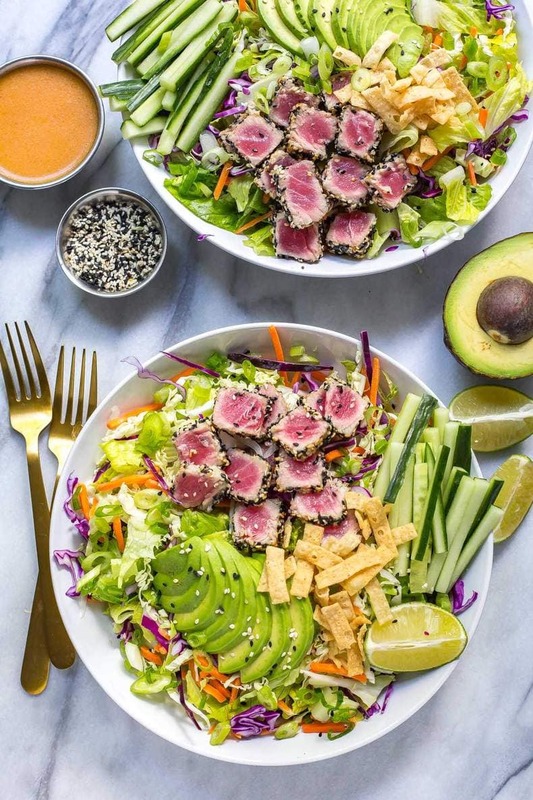 Let me tell you about this Sashimi Tuna Salad with Carrot Ginger Dressing. First of all, I'm not ashamed to admit that it's sort of my own version of the salad at Joey's. Haven't heard of Joey's? It's this amazing chain (yes, I'm saying that about a restaurant chain!) of high end restaurants mostly based on western Canada. When I was working as a construction worker in rural Manitoba a few years ago, I discovered it while on vacation in Winnipeg and needless to say I was hooked! I might have had their steak and sushi combo one too many times while I was there…hey, I was on vacation, right?! I still remember having lunch at Joey's right before leaving the city to head back to our worksite with my then truck driver boyfriend and wanting to cry because I knew it was back to cold cuts and dry snack food on the road from there on out. 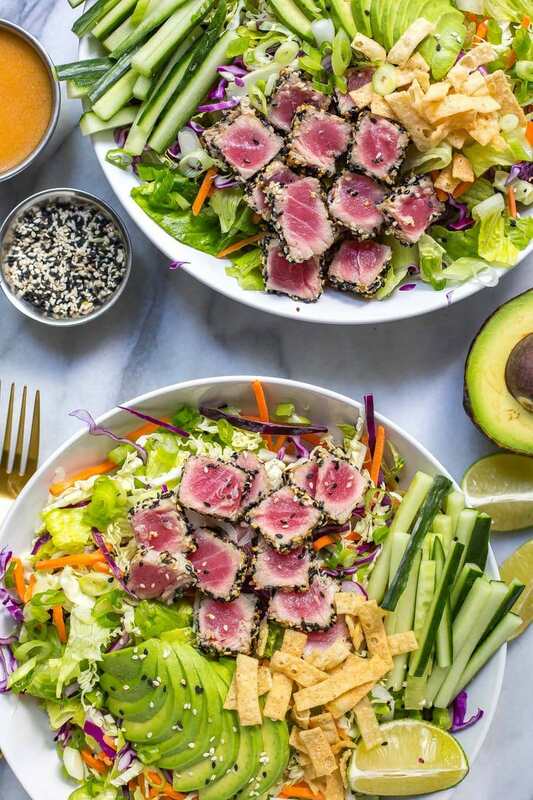 I sat staring at this insanely delicious sashimi tuna salad, the ruby red, perfect sear on the ahi tuna and pile of fresh veggies just taunting me, and me wishing I never had to leave. Well, that summer was quite an experience needless to say. I've worked so many odd jobs over the years (lifeguarding, working stock at a grocery store, cashier work, construction work and freelance writing work) that I still have to pinch myself when I realize that I've really succeeded at working on my blog full time. Honestly, it's a dream to make and shoot food as my day job, and I feel blessed to not only have a professional outlet for my creativity, but I also no longer have to go back to “roughing it” and leave my fave food behind. Because when you live to eat like I do, that's basically what it always comes back down to in life. The food. So, without further ado, let's get down to the nitty gritty of this Sashimi Tuna Salad with Carrot Ginger Dressing. That's then main difference between my version and the version at Joey's: the dressing. This is my fave salad dressing EVER as evidenced in this Rainbow Chopped Superfood Salad. Actually, that was one of the first salads I ever made for the blog that I was truly in love with. If you haven't tried chopped up broccoli in a salad yet, I don't think you're really a salad connoisseur. And in my typical fashion, that superfood salad was packed into mason jars. Maybe not as cool as these Shrimp Dynamite Sushi Jars, but it sure is healthy and just packed with veggies. Anyway, this dressing. 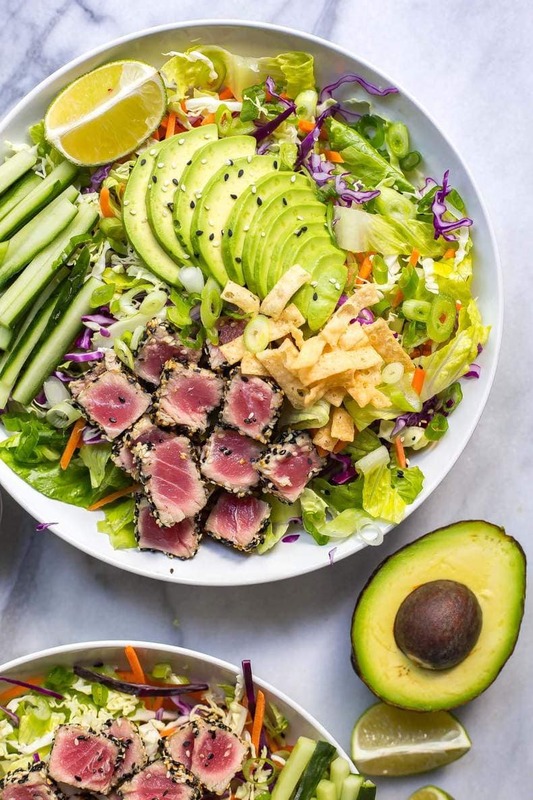 It's the same style dressing that you get at your local sushi joint, so you don't even need to head for takeout to make it at home. It's quickly become one of my go-tos over the years, even if it has a short shelf life. But the bonus is that you're getting an extra serving of veggies with your veggies. I mean, that's a win to me. Low cal and delicious. Gimme! For the tuna, high heat and low cooking time is key. 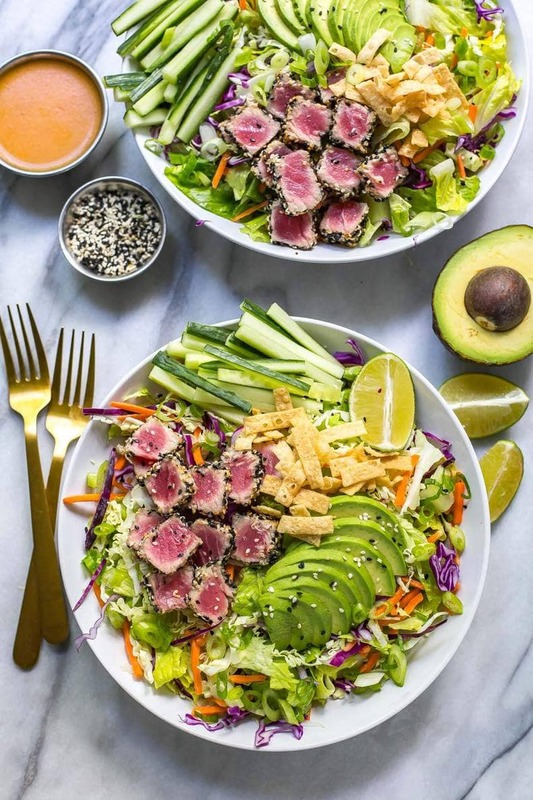 I like to use fresh tuna steaks when I can afford it (strike that – when I can find them at the seafood counter of my local grocery store), but the frozen steaks will work just fine here. They're much cheaper anyway, and more easily located. Coat your tuna in sesame seeds, season with salt and pepper, and sear on high heat for 30 seconds per side. You'll know the skillet is ready when you start to see the oil smoking. Once the fish is seared and the dressing is made, it's time to serve and enjoy! Boom, 30 minute meal on the table all chock full of nutrients and lean protein. Now somebody come over and make me this for dinner pretty please. I have wine. 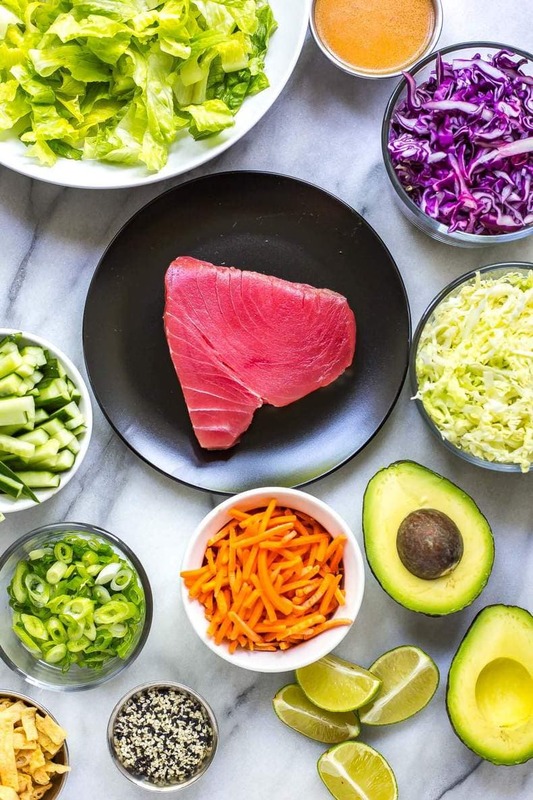 Will you be making this Sashimi Tuna Salad with Carrot Ginger Dressing? In a Magic Bullet, blender or food processor, blend ingredients for dressing. Set aside. Meanwhile, prepare veggies and divide evenly among four large salad bowls. Season tuna with salt and pepper before coating in sesame seeds. Add olive oil to a large frying pan over high heat. Wait until oil is smoking, then add tuna steaks, searing for 30 seconds per side. Remove from heat and slice with a sharp knife, adding half of each steak to each salad. 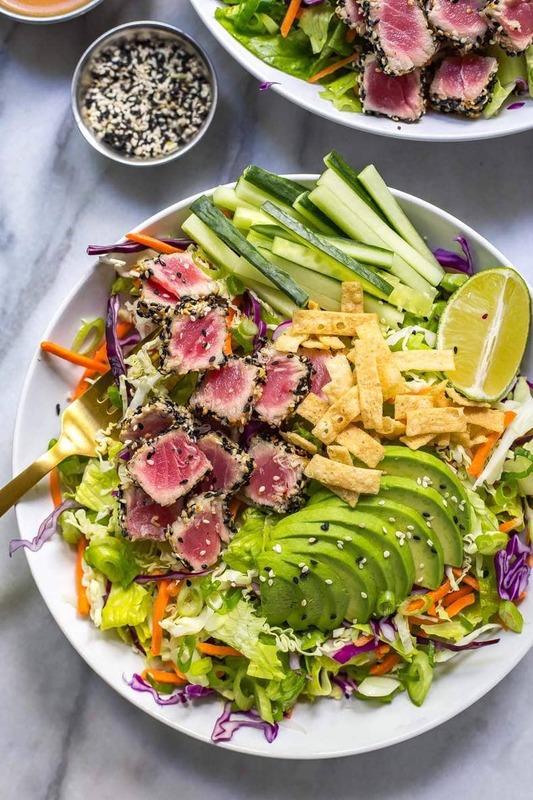 Garnish each salad with sesame seeds and wonton strips, then add dressing. Serve and enjoy! Whoa. Saw this on Pinterest and had to come immediately to get the recipe! Wow this salad is gorgeous! I also just saw it on Pinterest I had to come and check it out! Love it! Do you defrost the frozen tuna steaks first? This looks awesome and I want to try!! Just gorgeous. 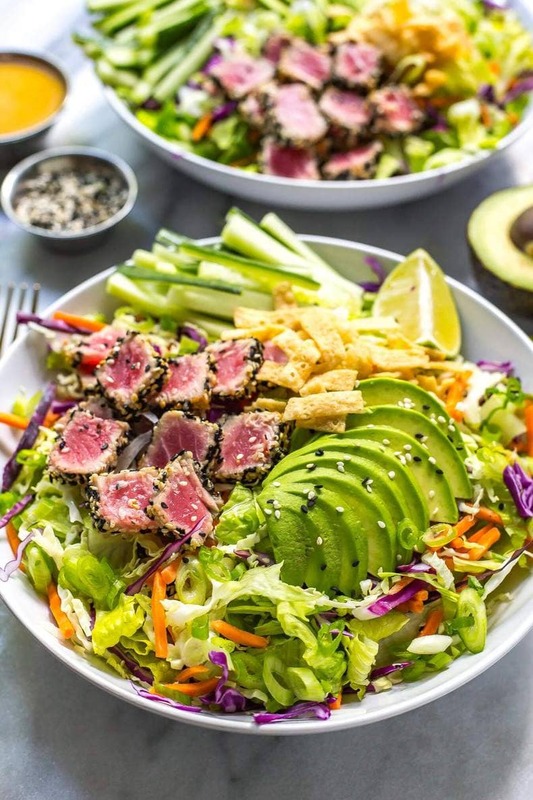 You cooked that ahi perfectly! I’m especially intrigued by the dressing – I thought you might have used carrot juice, but I love how you put magic bulleted it all!!!!! Hey girl, where in Toronto did you find your Ahi Tuna? This was really delicious. Instead of 2 tbs oil I did 1.5 and .5 of sesame oil.